It's amazing the effect a good bathroom cleaner along with a bit of elbow grease can have on your shower enclosure. We have seen shower heads and accessories that require just a little care and attention to be transformed and brought back to look as good as new. Not only will shower cleaning transform your bathroom but it will also play its part in helping you maintain good health. In fact, some visitors would rather go dirty than step into a mould and dirt-ridden shower enclosure. Let your guests talk about your beautiful bathroom and not the unsightly, mould filled shower. Please study this guide for some tips that will help you keep your shower sparkling. Due to the damp, moist environment, the bathroom is an ideal breeding ground for bacteria and mould. It is essential that you try and maintain a good airflow through your bathroom and if necessary install an air extractor fan. Even with a well ventilated bathroom you will need to regularly clean your shower enclosure. If you let your shower enclosures deteriorate too far then the chrome plated parts of the shower may eventually get affected making it difficult to get back to a shiny chrome finish. Mold grows in a moist environment and can be found all around us. According to the Centers for Disease Control and Prevention (CDC) mold poses a threat to health. Some people are more sensitive and prone to the health concerns associated with mold while others are more resistant. The CDC states that the health risks of breathing when in a moldy environment include: coughing, sneezing, nasal stuffiness, throat irritation, wheezing, eye irritation and skin irritation. In fact, the effect for people who have mold allergies or lung illnesses could be at serious risk and should completely avoid mold environments. The CDC notes that health risks may be present if you can smell or see mold spots in your shower. These are most common on silicone sealant and on the grout between shower tiles. Regular shower cleaning can help reduce any health risks associated with a dirty shower. Clean little and often - Limescale deposits can be quickly and easily removed if you keep on top of the task. Not only will your job be easier it will also be quicker and leave your shower always looking great. Dry the shower after use - This will help to remove water and soap scum from the glass before they dry and leave hard deposits on the glass itself. Apply glass cleaner - When you see deposits on the glass spray a standard glass cleaner onto the glass and leave for a minute. 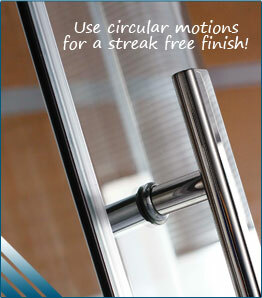 Clean Shower Glass - Using a clean paper towel rub the glass cleaner into the glass using circular motions. You may need to use a bit of elbow grease to remove those stubborn limescale deposits. First of all unscrew the handheld shower from the flexible shower hose. This will make it far easier cleaning shower heads without the need to stand in the shower enclosure. When cleaning some shower heads you can unscrew the cover. Doing so will allow you to give a more thorough clean to the inside of the shower head. Don't worry if the shower head can not be dismantled. 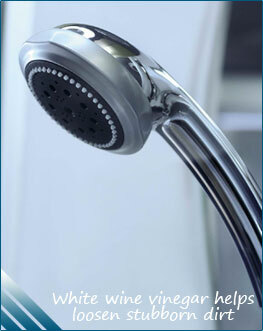 Soak the shower head for about 15 minutes in a bowl of white wine vinegar to help loosen the dirt and limescale. Use an old toothbrush to scrub the shower head making sure to clear up each nozzle hole. For stubborn dirt use a small wire to poke through each nozzle hole. Repeat this process as necessary. Once the nozzles are clear of debris simply screw the hand held shower back onto the shower hose and run the water through to make sure you have a free flowing stream of water. Mold can have a negative effect on your health. There are many specialist mold treatment products such as HG mould spray. HG mould spray will immediately kill fungus, moss, algae and molds but should be used carefully following the manufacturers guidelines. Simply spray the affected area and leave for the designated time, cleaning afterwards. 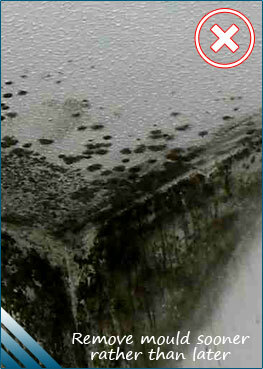 If there is persistent mould then you may need to re-apply. Use a damp cloth to wipe away all surface mould that can easily be removed. Use non-porous gloves to protect your hands. Wear a mask or N-95 respirator so that you do not breathe in the dangerous bleach fumes. Wear goggles to protect your eyes from the bleach spray and fumes. Open the windows and doors to your bathroom to create good ventilation and airflow. Never mix bleach with ammonia or any other household cleaners as this could result in poisonous, toxic fumes being inhaled. Carefully follow any manufacturer guidelines. Regularly clean your shower and bathroom with a mild bathroom product that also kills mold. Keep your bathroom well ventilated by installing an extraction fan vented outdoors, leaving the bathroom door open and opening windows to help clear moist air after you have a shower or bath. Try to maintain a humidity level of between 40-60% in your bathroom and house. If required, run a dehumidifier to reduce moisture levels in the air of your home. Fix any leaks in your bathroom so that the mold does not have any moisture with which to grow. Add a mould inhibitor to paint before painting. Do not use porous flooring such as carpet in your bathroom. Over time, hair and soap scum can build up or get caught in the showers trap or waste pipes resulting in a blocked shower drain. To help reduce the chance of a shower drain blockage remove any loose hair or debris that has collected on top of the shower drain cover after each shower. The first step to clearing a blocked shower drain is to remove the drain cover (where possible). This may simply lift out, require unscrewing or gently ease out with a screwdriver. Once the drain cover has been removed the blockage may become clearly evident. 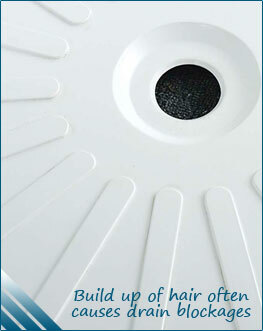 Look for any hair that could be tangled around the shower drain mechanism or lip. Remove the hair and any other debris before replacing the drain. If you can see the blockage but can't reach it then use a metal coat hanger that is bent at the end to hook out the tangled hair. If you can't see or access the blockage then you could use a drain rod or plunger to dislodge the debris. Simply push the rod down the drain until you feel the blockage. Push the rod back and forth into the blockage until it break up or clears. 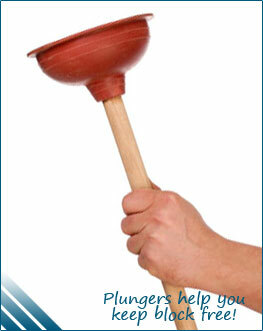 With a plunger create an airtight seal by covering any overflow openings (particularly with baths or sinks). Place the plunger over the drain and then pump the plunger up and down to try and dislodge the blockage. If this doesn't clear the shower drain then you can try a chemical solution. If the debris causing the blocked shower drain is out of site then you could use a cleaning solution to clear the drain. When a drain gets blocked you can buy a specialist drain blocking solution that would be available from most supermarkets. Alternatively, if you do not have any drain cleaning solution you can use baking soda and white wine vinegar to perform a similar task. Firstly, wait for the shower enclosure to dry. Next, put about half a cup of baking soda down into the drain (removing the shower drain cover if necessary). Now, pour about 2 cups of white wine vinegar into the drain. The white wine vinegar will then mix with the baking soda creating a mild reaction that can help dislodge the hair and debris that is in the drain. Once the solution stops bubbling then you can run water into the drain for a few minutes to help clear any debris or hair. Repeat this process regularly to make sure you keep your shower drain clear and block free. This shower cleaning guide has aimed to provide information about cleaning your shower glass, shower head, mould and drain. If you encounter persistent drainage problems then you may want to consider having a professional plumber check the problem. It is even possible that tree roots can push through any hairline cracks in underground drains and slowly build up inside the drain.